Seven of Sarah Palin's closest confidantes have yet to watch the HBO film "Game Change," which portrays her 2008 vice presidential bid, but they said they have already seen enough. Palin's former aide Jason Recher dismissed it as a "false narrative cobbled together by a group of people who simply weren't there." Randy Scheunemann, who tutored Palin on foreign policy matters during the campaign, said: "To call this movie fiction gives fiction a bad name." 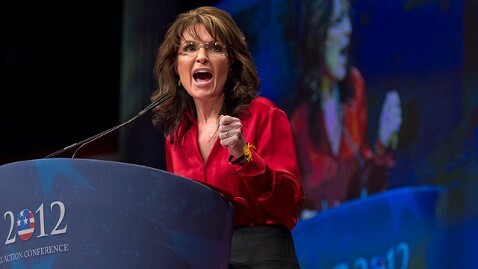 "Looking at the trailers alone, get's my blood boiling," Palin's former spokeswoman Meg Stapleton noted. The three were joined by the treasurer of Palin's political action committee, Tim Crawford, Palin's former lawyer Tom Van Flein and aides, Doug McMarlin and Andy Davis. Crawford, Recher, McMarlin and Davis all currently have paid consulting contracts with Sarah PAC. None of the seven have screened the film, but based on what they have seen in a two-minute trailer and what they know of the book, "Game Change," authored by journalists Mark Halperin and John Heilemann, each said the movie presents an inaccurate portrait of Palin. They took particular umbrage with Steve Schmidt, an adviser to Sen. John McCain who served as one of Palin's top handlers during the 2008 race and who has emerged as a public critic of the former Alaska governor since then. "He is abusive, he is abrasive, he is nothing short of a world class bully," Stapleton said, adding that he is "infamous for lining up and destroying." Pointing the finger of blame, Stapleton said the news media has an "insatiable desire to beat and beat and beat her" and added that a lesser person "would have hanged himself by now." Schmidt is played in the movie by actor Woody Harrleson, Palin by Julianne Moore and McCain by Ed Harris. Stapleton savaged a clip in the movie trailer depicting Palin lying in a bathrobe in the fetal position surrounded by note cards. "That's sinful," she said. "Steve and Nicolle are gifted communicators, but in the game of spin they'll say anything," said Davis, the political director for Sarah PAC. Palin did not participate in the conference call, but in a recent Fox News Sunday interview she said she was "not concerned about an HBO movie based on a false narrative when there are so many other things to be concerned about." Most of the aides said they had not been contacted by the filmmakers or the authors of the book on which it is based. "If the book was very misleading," Scheunemann said, "the movie is going to be far worse."